DR. HANNIBAL/ST. GERMAIN: Beloved coworkers, equal participants in the Second Coming program for Sananda’s return and the coming again of Christ consciousness to all on planet Earth, I am your elder brother Dr. Hannibal/St. Germain, in hieronic orbit aboard ship #1236, stationed for yet a few days above this headquarters unit. I speak in conjunction with Zorrah of Neptune, Shantar of Saturn, and Krator of Mars. 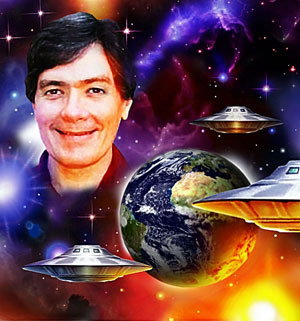 For we have formulated a special programing from aboard this hieronic sister ship to complete the integration of the energy downloads that we have accumulated for the benefit of all on planet Earth, and which we are in the process of downloading into this force field upon the return of Dr. Robert and MariLyn from the East Asia Mission. Interdimensionally and interplanetarily, what we have accomplished during the course of this assignment will take many years to be manifested fully upon the physical dimension of planet Earth. But we are off to an excellent start in grounding the implantations of light that we have initiated all during this spring cycle. As Shantar of Saturn, my so-called vice admiral in Tristar Command, has indicated to you through universal sign language which this triangulated team has witnessed, we are soon to complete the infusion of specialized transmutation frequencies begun this past Christmas cycle. Much has been accomplished in these procedures, especially in recent weeks as you have taken this vibrational frequency and spread it throughout the planet during the course of the East Asia Mission and by way of your connections with your fellow beings in those realms. Zorrah, on his part, has been most effective on his assignment and has been with me in recent days, since the return, helping you to incorporate these magnetic frequencies into the physical-dimensional environment through your four lower bodies and anchored unto the physical plane, promulgated also throughout devic-elemental kingdoms by this effort at implantation. Krator of Mars, who has been stationed aboard this craft #1236, also has been busy with his hieronic programs under his team’s effort, overseen by my ultimate command; and has adjusted his gauges, you might say, in order to produce the highest effect in grounding these vibrational frequencies that we have accumulated during the course of the mission and have brought back to this headquarters focus, that it may be a constant beacon of light to amplify these messages henceforth throughout the planet. 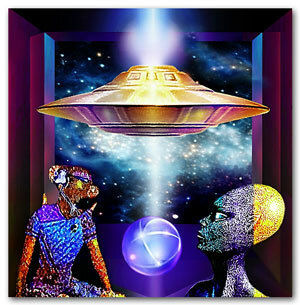 I have been designated spokesman from aboard this craft under my command, for I am joined with all hierarchal forces from etheric and celestial planes, who are coordinated with me to establish this new ascension for planet Earth. As prophesied, we are leading you into the fourth dimension. And by the activities that we have sustained as a team effort, both from our realm and within your realm on the physical plane of Earth, we have established a new foundation for your ascension into Christ consciousness as you move forward into the New Age of Aquarius. Summalt and I, commanding the etheric space forces, have kept these hieronic projections, as previously mentioned, in a balanced force field, East and West, so that the planet Earth as a whole may move unimpeded into these new matrices of light and love in action as you express your new grounding of Christ consciousness in expectation of Sananda’s return. As one, we say unto you all: hail to the Christ in thee! We are forever bonded with one another for this high purpose to establish a new heaven on a new Earth. And so it is. As you maintain this new level, you shall bear witness to the higher manifestations that now may come forth in times ahead. So, we thank you and we bless you for all your efforts, joined with ours, for the upliftment of humanity on planet Earth. Well done. We shall continue these energy integrations through the time cycle of your summer solstice, and then we shall ascend from these environs as you further incorporate your newfound ascension. Dr. Hannibal/St. Germain, speaking for the hierarchal command from aboard ship #1236, enfolding you with our love and our salutations from the many realms and planets of our beloved solar system. So be it. Over and out. Note: Our Hierarchal Board meditation this evening was the first one since Dr. Robert and MariLyn had returned from the East Asia Mission on June 16th. Over the past several days we have been steadily absorbing the Hierarchy’s energy transfers, holding ourselves in good balance while we integrate a whole new level of vibrational frequency. During the meditation I was contacted by a hieronic beam from ship #1236, in etheric orbit above our headquarters since about mid-May. As I peacefully anchored the projections, Zorrah of Neptune overshadowed me, simultaneously showing himself to my clairvoyant vision more clearly than ever before. Enhanced magnetically by the hieronics, he grounded his unique higher-dimensional physical vibration through me. My chakra centers, particularly around my head and throat, became revved up. I thought he might channel, but after a few minutes he receded. Then Shantar of Saturn, commander of Hannibal’s special-operations unit known as Tristar Command, transfigured through me with full force. His refined etheric vibration, expressed on a different planetary wavelength than Zorrah’s, fully remolded my force field with a new set of extraterrestrial elements. Once I had adjusted to his sudden appearance, Shantar levitated my left hand, formed his signature, then with both hands performed universal sign language. Through his graceful esoteric symboling, characteristic of Saturnian mystery schools, he anchored into our group force field an energy packet of Tristar transmutation functions. Although my chakras were further accelerated, as if in preparation for a vocal channeling, Shantar departed when he finished the sign language. Next in turn, Krator of Mars, one of Hannibal’s lieutenants aboard ship #1236, overshadowed me, hieronically boosting his own extraterrestrial individuality. The Martian’s transfiguration, replacing Shantar’s, abruptly reshaped my energy form and produced within me an entirely different range of auric and physical sensations. Even my physical breathing assumed another rhythm. Although my system had been fine-tuned a third time for a potential vocal channeling, Krator quietly left when he completed his grounding. Each extraterrestrial being, in relatively quick succession, had implanted the special vibrational frequency of his separate planetary function and expertise. As I absorbed the vibrations of the three contacts, Dr. Hannibal/St. Germain appeared. Masterfully, he coalesced and harmonized the disparate extraterrestrial elements. In essence, he molded them into a holistic unit of light. Telepathically he relayed that he and his team had formulated a special hieronic program, comprising multiple planetary vibrations, in order to complete the energy transfer by the summer solstice, June 21st. He then signaled he would channel vocally. By the conclusion of my master’s communication, I had been propelled into a new ascension of consciousness. As one representative among many, I had experienced what he had prophesied for planet Earth. I bore witness to a higher manifestation within my being. May all of us together establish the new foundation of Christ demonstration. So be it. Photos: (1) Earth and Starcluster with Spaceships (collage by author of anonymous cosmic art, recolorized, with golden spaceships © by Hartmut Jager). 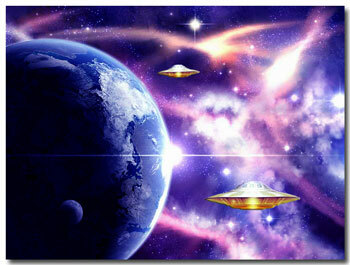 (2) Interplanetary Collaboration © by Hartmut Jager. 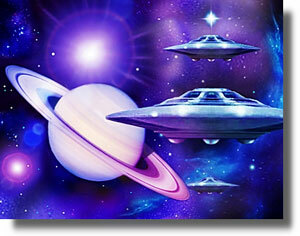 (3) Saturnian Ships © by Hartmut Jager. LISTEN TO PODCAST: Click on the “Play” button below to listen to the above communication, as recorded live on 6/19/13. This recording was released on I Am Network of Light tape #1079B, for the week of 9/29/13.